Despite the dubious nature of the yogurt portion of the product, these are pretty good, nutrition-wise. The 90-calorie pack has 10% of your daily recommended dose of calcium, 25% of vitamins A and D, and 100% of vitamin C, though it does also contain 8% of your daily allowance of saturated fat. The bag also contains â€œLive & Active Bacterial Cultures.â€ I was glad to hear that the bacteria are both live AND active, because I have no room for lazy bacteria in my large intestine â€“ they gotta be hard-working, motivated, eager to get out there and do… um… whatever all this probiotic stuff is supposed to accomplish. Like so many other things, these look a LOT nicer on the package than they do in real life. Rather than being neat little white balls with bits of gummy showing through, theyâ€™re kind of lumpy and misshapen, and a rather unattractive, uneven pinkish color from the gummy portion showing through the â€œyogurtâ€ coating. They look like wads of chewed gum that some patient person has managed to roll into vaguely spherical shapes. The coating also seems rather dry and crumbly, in some cases flaking right off the gummy at the center. The coating has a vague creamy white chocolate flavor over a surprisingly sour cherry center – kind of like a sour cherry Twizzler. The coating doesnâ€™t melt in your mouth like chocolate â€“ it has a very dry, almost flaky, doughy texture, with the coating on a few pieces crumbling away into grainy, gritty bits in your mouth. Eaten by themselves, the gummies have a weird doughy texture too, closer to cookie dough than licorice. In fact, thatâ€™s a pretty good overall description of these â€“ like lumps of slightly chewy, very sour cookie dough. If thatâ€™s your thing, more power to you I guess â€“ but when it comes to healthy yet tasty snacking, Iâ€™d choose a bag of regular fruit snacks and a bowl of real yogurt any day. I tried these a couple of years ago and was really disappointed. Well, disappointed isn’t quite right, because that means that I had some expectation of them being good from the description. Someone gave these to my kids and I swear I used to eat a ton of Welchs product growing up but now they taste so icky, I keep finding that it was stale and probably should not even be made, like eating tires, though I have never tasted a car’s tire. There used to be a product in the 90′s that was similar to this product. I can’t remember what it was but the commercial was a tree that would talk a shake and these yogurt covered fruit snacks fell down from it. The company also made yogurt covered raisins, the box was green. Instead of the gelatinous fruit snack, it was more of a gushers type candy. Does anyone remember this? 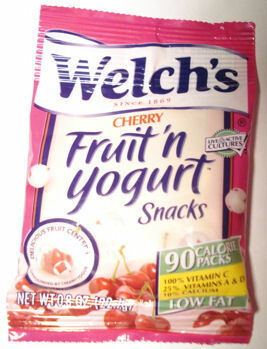 These were much tastier than the Welch’s product.